In a typical scenario, the NPE contacts a legitimate business with a demand letter claiming infringement of questionable Patent A (let’s say Patent A is a business method patent that applies to any business using doors to enter their building). The targeted business is given the choice of settling for a “licensing fee” or facing a lawsuit. The NPE model works because it costs a lot of money for a legitimate business to defend itself in court, whether the lawsuit has merit or not. Since most NPE’s have neither offices nor employees, it costs them very little to bring the legal action. 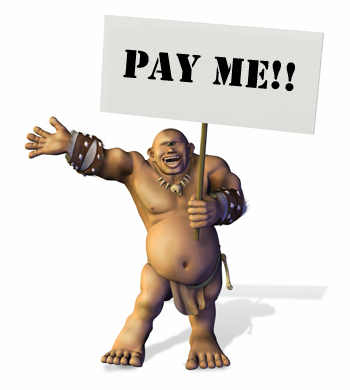 Most patent troll lawyers work on a contingency fee basis. For companies fighting these threats, legal expenses can climb into the millions – as many have found out to their dismay. Some have chosen to fight on principle and eventually “won”, while going bankrupt in the process. There is a real cost to society associated with the activities of patent trolls. Beyond the cost of paying out what amounts to protection money, fear of patent trolling discourages legitimate innovation in the marketplace and slows job creation. Once limited to mostly technology and software companies, trolls now send blanket demand letters to retailers, restaurants, hotels and all kinds of other main street businesses. In some cases, they do damage to people far removed from the original suit, such as members of credit unions who are targeted with blanket demand letters for use of standard financial technology. If the credit union settles, the money comes out of the pockets of its members. At this point, a total of 28 states have passed or are about to pass similar legislation. In addition, the Supreme Court has weighed in on some key patent trolling issues, in the process invoking a small portion their supreme wisdom on the side of good. In a 2013 decision, the Court made it easier for defendants to force NPE’s to pay attorney’s fees. This ruling makes actual lawsuits riskier for the trolls, and trolls hate risk because it costs them money. In a potentially huge 2014 ruling (Alice Corporation v CLS Bank), the Court essentially negated the definition of which types of inventions can be protected. The shakeout of this decision is still being assessed. The bad news is that nothing seems to go smoothly in Washington, DC and the Act appears to be stalled. Whether you own a business or in your capacity as a citizen, I believe this would be a good time for your Congressman and Senator to hear from you in support of HR 9.
Who knows: you might be the next patent troll victim.